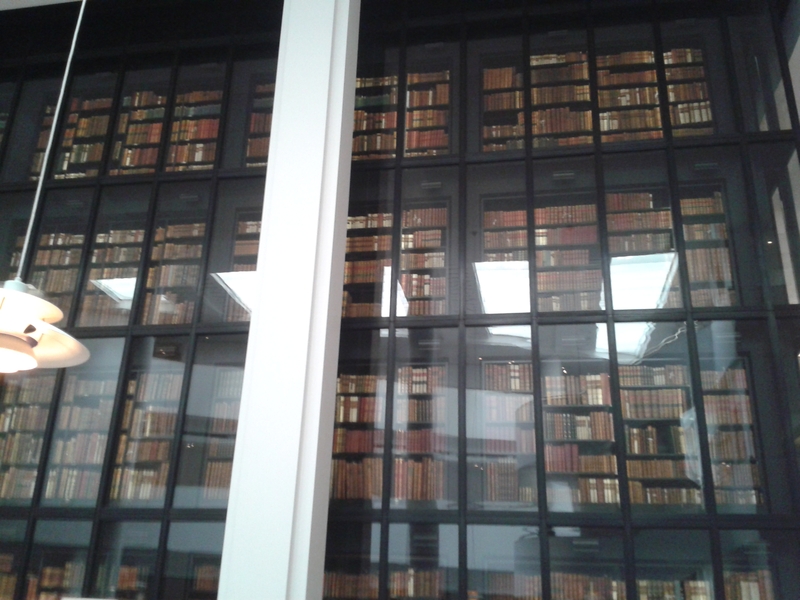 The British Library, Britain’s keeper of words; holder of literature history; packed to the rafters with overwhelming works of genius (and a rather lovely restaurant); is currently home to Beautiful Science. I approached the exhibition with anticipation, unsure what to expect: infographics interest me, being the data geek I am, but the British Library’s website hadn’t given me any hints as to what angle the exhibition would take. Initially I felt a little stab of disappointment as the exhibition appeared to merely consist of a few graphics and notebooks. But, peering round the corner, I discovered I was mistaken. A small world of data opened up before my eyes. Broadly the exhibition covers the history of displaying data, through a variety of methods, within three topics: The Tree of Life, Public Health and Climate and Weather. Ship’s logs, Linnaeus’ taxonomic diagrams, NASA’s climate models and the NHS’ public health data all form part of this excellent exhibition. 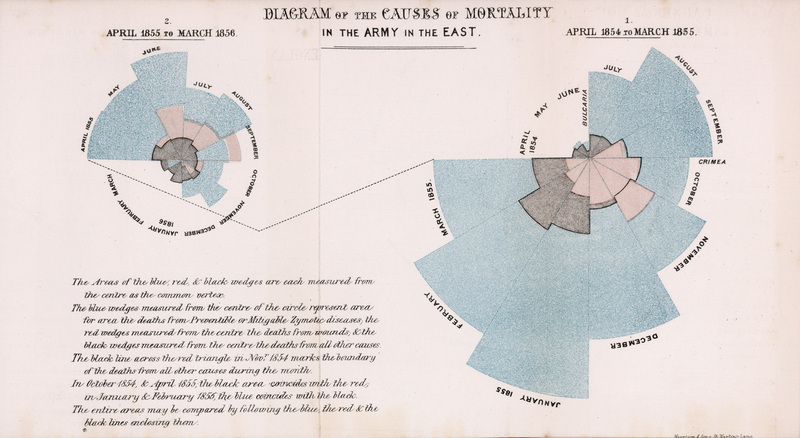 Particularly striking was the juxtaposition of Florence Nightingale’s famous ‘rose diagram’ The Causes of Mortality in the Army in the East,in her original notebooks alongside an updated, animated version of the rose as well as a bar chart and icon diagram. Both sets of data demonstrate the effect of sanitary reforms upon hospital deaths during the Crimean War: fewer soliders died of preventable diseases as the war progressed. Diagram of the Causes of Mortality in the Army in the East, an example of Florence Nightingale’s polar rose diagram. PD-US. The updated bar chart makes it easier to spot trends, but the ‘rose diagram’ is visually interesting, allowing readers to easily compare two years. Nightingale’s grasp of statistics persuaded the British Government that cleaner hospitals would save lives, introducing a new standard of hospital care. The ‘rose diagram’ is a masterpiece of clear communication, from a woman described as “a true pioneer in the graphical representation of statistics”. Epidemic Planet was another favourite, an interactive allowing visitors to change certain parameters to see how fast a virus spreads to cause a pandemic, and the impact of any preventative measures. As a fan of the game Pandemic, it was great fun if a little scary to model how quickly a virus can spread (note to self: avoid major cities and airports). Models such as these can help policy makers to understand how diseases spread, and what can be done to prevent a catastrophic pandemic. From a digital perspective, the juxtaposition of handwritten material from the 1800s such as ship’s logs, next to interactive models such as NASA’s wind data, helped me to understand how infographics have been used for hundreds of years to display data. (I had previously, naively, thought they were a modern, somewhat faddish, invention. I suspect this is partly due to the Guardian’s excellent, if somewhat ubiquitous, use of infographics online.) Although data gathering methods have increased in sophistication, and in some cases the type of data gathered has changed, the ability of infographics to impart useful information remains as relevant now as 1852, when William Farr used infographics to explain how temperature affected the spread of cholera. Real world examples were utilised throughout the exhibition, helping visitors to draw conclusions about the usefulness and relevance of infographics as a method of communicating. Digital interactives could easily be compared with handwritten (or hand-drawn) data from hundreds of years ago, enabling each infographic to be seen in a historical context, rather than in isolation. I genuinely wanted to use the digital interactives to glean information, allowing me to compare this data with historical data, rather than in so many exhibitions where digital interactives are simply stuck in as institutions feel they have to have something digital in there. Even for non-data geeks, allowing people to manipulate data such as in Epidemic Planet helps them to get an immediate understanding of the point being conveyed. As the British Library says, infographics are “tools of discovery, as well as communication lies in both the insight they inspire and their aesthetic qualities.” It’s a journey through data visualisation, and food for thought for how we can all represent data in an easily understandable manner. It’s not on for long, so catch it while you can!